Perhaps I should have returned to Beauvais, but I preferred a Western approach entry into Paris. If I had wanted to get a glimpse of the England football team at their base in Chantilly, pass the Stade de France at St Denis, or see the start town of the final stage of the Tour de France, Beauvais would been convenient. But I favoured the upmarket route via the Roland Garros tennis stadium, Parc des Princes football ground and the various horse-racing courses around the Bois de Boulogne. My destination was Vernon, a neighbouring village to Giverny, the home of Claude Monet. Most people arrive at this town as the gateway to Giverny but it is worth exploring Vernon before visiting Monet's house and garden. 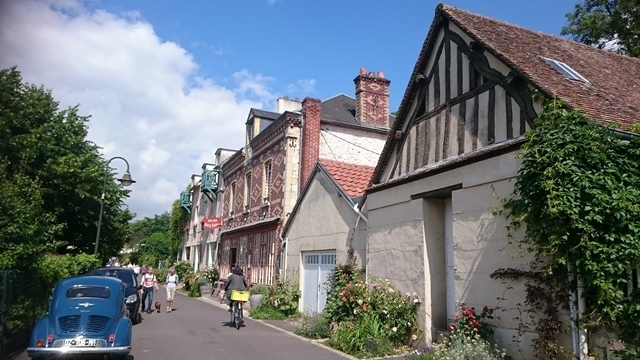 A bike hire shop right outside the station means that you can do a mini tour of the meandering streets before heading to the Claude Monet village. 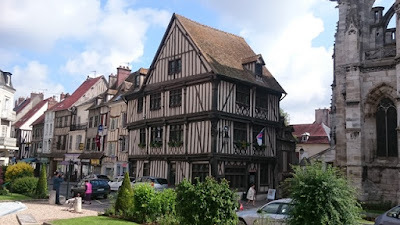 There are some beautiful 11th century buildings from the time of the Norman Conquest, and Vernon has its own Notre Dame Cathedral, as well as many medieval buildings, with wood carvings in the architecture. It is a real not-so-hidden gem! Giverny was lovely, too. Beautiful stone buildings that were converted into art galleries, pretty gardens and tea rooms, and other lived-in cottages. This town was certainly more touristic than Vernon, and that made it slightly difficult to ride my bike through the crowds of folks who had travelled from far and wide. It was a relief to get back onto the open road and ride unimpeded. Today was a lovely day to be out on a bike ride, and as such, there was a real feelgood factor riding through the various quaint villages in the Vexin area. It was just as well that the villages had something worth looking at, for the terrain was a little bit challenging. It wasn't the Alps, but the roads in this area are by no means pan flat! But what you gain in height you also gain in lovely views - such as a spectacular vista over the River Seine snaking through the forest below while I was cresting a road surrounded by rocky outcrops at La Roche Guyon. On this sunny Sunday afternoon I rolled through many deserted country lanes. It was possible to stop at the side of the road by the arable fields for a sandwich or a nap, and be completely undisturbed. I didn't do that though, as Paris was tantalisingly close and I was really looking forward to reaching the heart of the city. In fact, at this point Paris is frustratingly close. 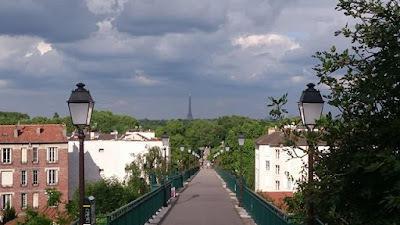 I kept getting views of either the La Défense skyline at Poissy and Le Pecq, or of the Eiffel Tower when in St Cloud, but there were still lots of obstacles to get over first - hills, bridges, woodland, unwanted propositions on the pedestrian bridge to the Bois de Boulogne. And someone even had the cheek to set up a fun-fair on my road through the St Germain-en-Laye forest! But after passing through the lovely, leafy western Parisian suburbs of St Germain, La Celle St Cloud, St Cloud, and Auteuil, I finally entered the city of Paris via the Porte de la Muette, where I was immediately in Trocadero and greeted by the sight of the Eiffel Tower, resplendent in its home on the Champ de Mars. This is one of my favourite views - notwithstanding the football fan park underneath! Shortly after that, my route took me to the centre of Paris - the Charles de Gaulle Etoile roundabout - with the Arc de Triomphe in the middle of the chaos of this 12-point star! Lovely. As France were playing a football match that evening the roads were unusually quiet, which meant I had a very straightforward ride through the city centre. I whizzed around the Etoile junction, endured the bumpiest ride down the cobbles of the Champs Elysées, while still enjoying the thrill of riding down one of the most famous avenues in the world! This was the climax of my ride, and I really wanted to soak in the moment. The rest of my jaunt was by no means anti-climactic though. I still had Place de la Concorde, the Pyramides of the Louvre Museum, the luxurious shops of rue St Honoré, the Left Bank, and Notre Dame to behold. 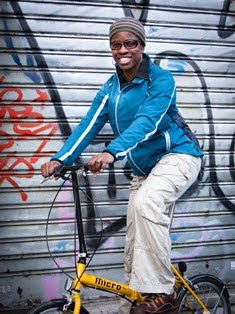 Yes, I was in Paris, and I had ridden my bike there. 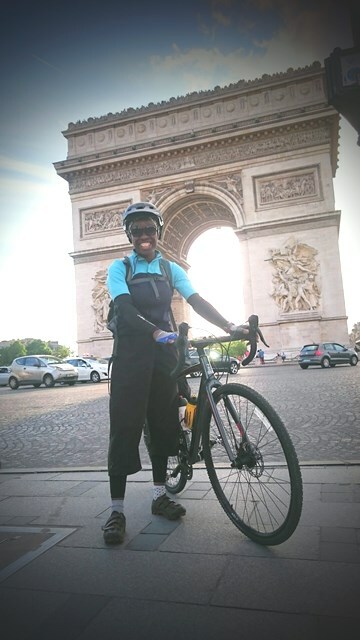 My bike-riding wanderlust around the Parisian region was satiated (at least for now), and I was happy!